NATO and NASA are joining forces to host an Advanced Study Institute for students and practitioners of astrobiology. March 30, 2001 -- When NASA's Pathfinder mission landed on Mars in 1997, public interest soared. The space agency was nearly overwhelmed by phone calls and emails from citizens who wanted to know what the rover was finding on the Red Planet. Some asked about the planet's mineralogy; others inquired about Martian weather. But an overwhelming fraction were interested in something else -- namely, life. Was there ever life on Mars? Do microorganisms live today in the soil, deep rocks, permafrost or polar ice caps of Mars? Are we really alone...? That's what people wanted most to learn. No one yet knows if life exists elsewhere in the cosmos, but researchers in the field of astrobiology are growing ever more certain of how and where it might be found. This fall, NASA will join NATO in sponsoring a NATO Advanced Studies Institute (ASI) entitled "Perspectives in Astrobiology” to be held in Crete from September 29 through October 10, 2001. The Institute will bring together distinguished lecturers from around the world who will share what they have learned about astrobiology in recent years with students and with one another. The preliminary list of speakers includes astronomer Sir Fred Hoyle, who brought attention to the possibility of biomaterials in interstellar space; Nobel Prize winning biochemist Baruch Blumberg, head of the NASA Astrobiology Institute; Thomas Gold, who accurately predicted that organisms would be found deep within Earth's crust, and David S. McKay, who pioneered the study of microfossils in the Martian meteorite ALH84001. Astrobiology is a multidisciplinary field encompassing life on Earth in extreme environments as well as the "distribution of possible life on other bodies within the solar system and within the cosmos,” says Richard Hoover, an astrobiologist at NASA's Marshall Space Flight Center and one of the Institute's three organizing directors. The practitioners of astrobiology include biologists, geologists, paleontologists, geochemists, astronomers -- it seems that no field of science is immune to the lure of astrobiology! When people think of extraterrestrial life, many think of little green men. But scientists suspect that the first extraterrestrials we identify may be a much simpler form of life: microbes. "Astrobiologists,” says Hoover, "are interested in what kinds of lifeforms live in very high temperatures, such as geysers and hydrothermal vents, and what kinds of lifeforms can be found living in very low temperatures, like in permafrost in Antarctica.” Extreme-loving microbes that thrive in such harsh environments on our own planet could reveal how alien life might survive on other worlds where conditions are even more severe. "What we're bringing together are distinguished lecturers who will make extensive presentations on their own subject,” says Hoover. The presentations will typically last an entire morning or afternoon with forty to sixty students in attendance. Advanced Study Institutes, says Hoover, are aimed at those on a doctoral, post-doctoral level, or beyond. They will be able to learn from David McKay of NASA's Johnson Space Center, for example, who plans to discuss the most recent findings on the Allan Hills meteorite ALH84001 -- a rock from Mars that landed on Earth 13,000 years ago and holds tantalizing clues to ancient Martian microbial life. "We have really detailed data on tiny magnetite crystals in ALH84001 that show they're identical to magnetites made by bacteria on Earth,” says McKay. The magnetite crystals have an unusual hexaoctohedral shape, and they contain no impurities at all. If you try to make such magnetites by inorganic precipitation, he says, any available minor elements, like manganese or magnesium, are always incorporated into the crystal structure. 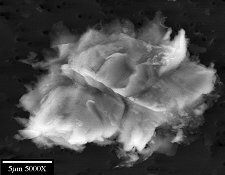 The pure crystals in the Mars meteorite appear to have a biological origin. McKay believes it's possible that present-day bacteria on Earth and ancient bacteria on Mars could be related. He points to the many studies showing that, due to meteorite impacts, Mars and Earth constantly trade material back and forth. 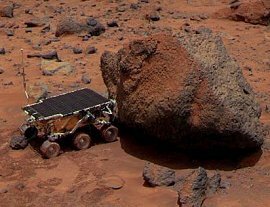 "There's probably half a dozen or more Mars meteorites that fall to Earth every year," he noted. McKay's work is just a sampling of the exciting topics speakers will address. The growing list of scheduled lectures is posted at the Institute's web site. An Advanced Study Institute, says Hoover, differs significantly from a conference. Intended as a high-level course, it's designed to encourage interaction among the participants. Everybody will stay together for the entire time. "We'll live in the same hotel and we'll eat meals together,” says Hoover. In an ASI participants have the ability to get to know each other, and to develop collaborations and working relationships. During the ASI, says Hoover, advanced students will present scientific papers detailing their own research, which may be published (after peer-review) in the NATO ASI Volume "Perspectives in Astrobiology." Advanced Study Institutes help break down the barriers of language and distance that sometimes separate international scientists. "A specific aspect of these NATO courses,” explains Prof. Em. Roland Paepe (Free University of Brussels), an expert on permafrost and an Organizing Committee Director of the ASI, "is that they include participants from both NATO and NATO partner countries.” That's significant, he says, because it can be hard for researchers to find out what's going on in other places. Above: Prof. Roland Paepe (right) visits Crete to prepare for the NATO Advanced Study Institute "Perspectives in Astrobiology." Dr. Alexei Rozanov, Director of the Paleontological Institute of the Russian Academy of the Sciences, regards the Astrobiology ASI as a significant step. Rozanov, another ASI Organizing Committee Director, co-founded the field of Bacterial Paleontology -- the study of fossil microbes. "It's necessary,” he says, "to start educating young students to study astrobiology and bacterial paleontology,” he noted. The conference in Crete, he believes, will help make this happen. David McKay says he's seen a tremendous spurt in the interdisciplinary science. It's been great, he says, to get the biologists to talk to the geologists, for example. "That's really what's created the field of astrobiology.” And the field, he thinks, will continue to advance. Organizers of the Advanced Study Institute are still accepting applications from prospective students. If you are interested in attending and contributing to the "intellectual ferment," don't wait because the application deadline is April 15, 2001. Click here to apply. Perspectives in Astrobiology -- "This NATO Advanced Study Institute considers the paleoemergence of life on Earth and Mars and the relevance of microbial extremophiles from the deep subsurface and hydrothermal vents and ancient viable microorganisms from deep ice in the polar caps and permafrost to planetary habitats and Astrobiology." Science@NASA -- one of the Advanced Study Institute's 2001 sponsors. NASA Astrobiology Institute -- a good source of news and information about astrobiology.